GCJRTN will host a playday at the home of Janet Rose & Van Shaw. The address is 2700 Old Navasota Road, Brenham, TX 77833. We will have a simple lure course, racing and GTG. Please bring a small contribution to our group lunch; a covered dish would be nice, just keep the weather in mind! Please check back with the website in case there are problems due to weather. Hey guys, my Co-Chair for Hospitality & Special Events, Jean Wallwin, has come up with a lovely Autumn/Fall Basket for our 10/13/07 Playday raffle. You do NOT have to attend the playday to purchase tickets for the raffle. 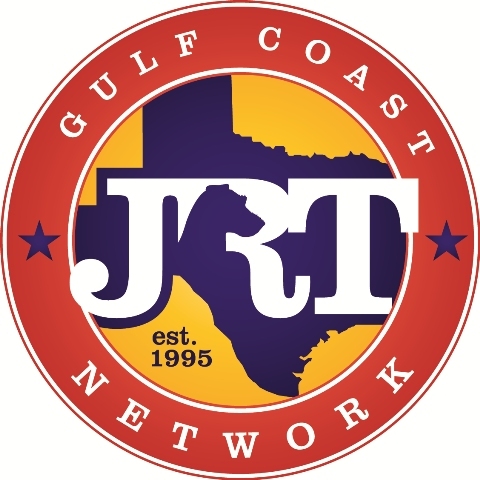 You can email me with how many tickets you want and then send a check made out to Gulf Coast JRT Network - c/o Lisa Dernick, 6014 Pebble Beach Drive, Houston, TX 77069. Jean (Wallie) has put it all together and embroidered everything herself. Just too crafty!!! One pkg of spider web shaped pasta & a few other fun items! Wallie is donating this for the club and the proceeds go to March 2008 trial expenses. Raffle tickets sell for $5 each or 3 for $10. Folks, our club needs your financial support, it not only takes time and man-power to put on a quality JRTCA sanctioned trial, it takes $$. A handful of club members not only donate their time, but they donate dollars to the purchase of new equipment; such as the new race box we will have for March 2008. Priscilla David & Jean Wallwin have volunteerd their personal time to go to Ohio and collect it after Nationals. Prizes and ribbons go up every year, but the budget doesn't. We could use new hurdles as well as other pieces of agility equipment. It costs money to advertise our trial in other club flyers and it also costs money for postage, for running the website, for the annual gift basket we send to the JRTCA National trial, for equipment repairs...you get the picture. We need more people to sponsor classes, divisions and prizes! Won't you please help us be one of the premier clubs in the Nation? Buy raffle tickets for our playday and at our trial, bid generously at our auctions...or just make a financial contribution, no amount is too small. GET INVOLVED!!!! Tickets for $5 each or 3 for $10.